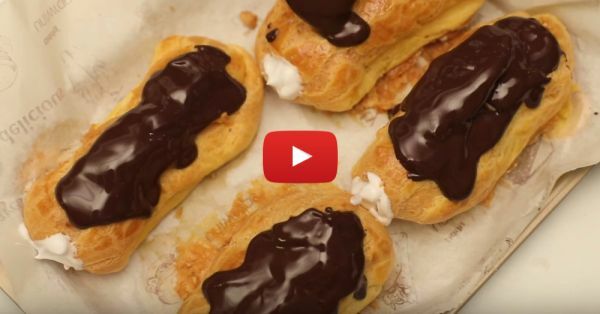 Learn how to make Chocolate Eclairs Easily at Home! - Line a baking tray with baking paper. Set aside. Preheat oven to 220 C.
- In a medium saucepan, mix water, butter, and sugar. Bring to a boil. - Lower the heat and add flour. Cook for a minute. - Remove from heat and add in the eggs, one by one, beating after each addition. The dough should be thick and glossy but should come off the beater slowly. - Pipe thick even lengths of dough onto the tray. Brush with egg wash and smoothen out the top. - Bake for 15 mins. Reduce the temperature to 190 C and bake for another 25 mins or until golden brown. Do not open the oven door while baking. - Whip the whipping cream until soft peaks form. - Poke a small hole at the end of the eclair. Fill with the whipped cream. - Pour the melted chocolate on top. Let it cool until the chocolate hardens. Gobble them yummy chocolate eclairs before it’s gone! Hope you have learnt how to make chocolate eclairs at home with this easy recipe. For more such videos, do subscribe to POPxo Yum here.